This Saturday saw 548 crews race the Hampton Head, hosted by Hampton School Boat Club on its home stretch of the Thames. The event was divided into two divisions over morning and afternoon sessions allowing many crews to split into small boats for a second run. 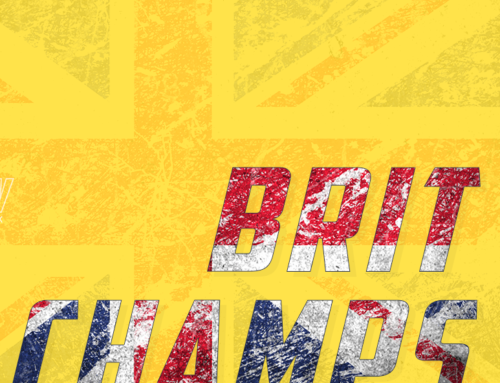 St Paul’s School didn’t enter the J18 M8+ division leaving Eton, St Edwards and Hampton to share the spoils. Eton won by a margin of 1.7 seconds over St Edwards but many crews were way off the pace in a race won in a time of 7:59:5. It will be interesting to see how these crews can move forward in the next four weeks before the Schools Head on March 12. Looking at St Paul’s confident and professional performance at Quintin Head, 20 seconds ahead of nearest rival, Abingdon School, it’s hard to see any of these crews being contenders on their Hampton showings. In the J18 M4- there was an impressive performance from the Molesey crew of Mikey Dalton, Cameron Spurling, Theo Darlow and Felix Warren, who beat Great Marlow School into second place by 7 seconds. 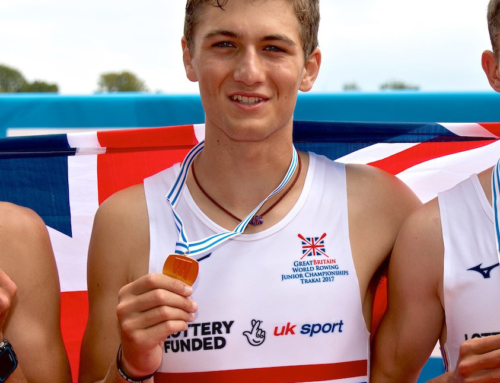 Dalton, Darlow and Spurling represented GB at Coupe de la Jeunesse last year with Dalton and Darlow winning two golds in the J18 M4- and Spurling a gold and bronze in the J18 M8+. 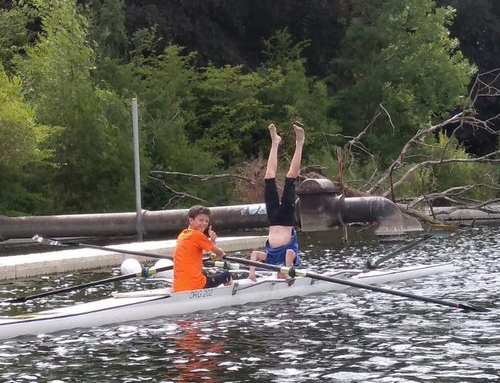 Darlow and Warren were in the Molesey 1st Eight that won the Child Beale at National Schools Regatta in 2017 and all are going for GB trials in two weeks time. Molesey didn’t have a great start to the day after Spurling stubbed his toe ripping the nail back just prior to boating. However, a quick application of some electrical tape and he stoically carried on. In the J18 M2- Darlow and Dalton won by an impressive 19 seconds over teammates Spurling and Warren who finished in second place. The four encountered further calamity when Warren, steering in the bow, collided with a marshaling boy 750m from the finish. For the girls, the Henley Rowing Club J18 W4- continued to show the early form they demonstrated at the Head of the River Fours, winning by 14 seconds over Putney High School. In the J18 W8+ the Henley Rowing Club again exerted their dominance beating Lady Eleanor Holles into second place with Marlow Rowing Club taking third. The crew of Phoebe Fletcher, Lottie Orr, Sophia Hahn, Mary Wright, Daisy Butterworth, Georgie Robinson Ranger, Phyllis Barter and Issy Jonsson claimed the win by 12 seconds after a stand out performance. In the J18 W4x Tideway Scullers came in 9 seconds ahead of Latymer Upper School in second and Henley Rowing Club in Third. 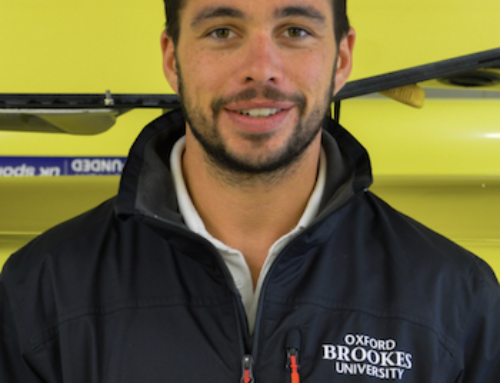 In the J18 M4x, Windsor Boys School, who won the Fawley Challenge Cup for junior quads at Henley Royal Regatta last year, were beaten by Maidenhead Rowing Club although in a different lineup. Other notable results include a win for St Paul’s School in the J16 M4+ stroked by Dominic Valt who won the J16 M1x at the Scullers Head. 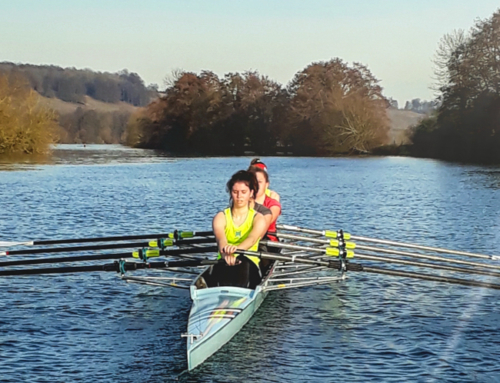 Lottie Orr, the sister of the University of London 2nd Eight stroke, Hattie Orr, and Georgie Robinson-Ranger of Henley Rowing Club, won the J18 W2x ahead of their appearance at GB trials in the same boat in two weeks.